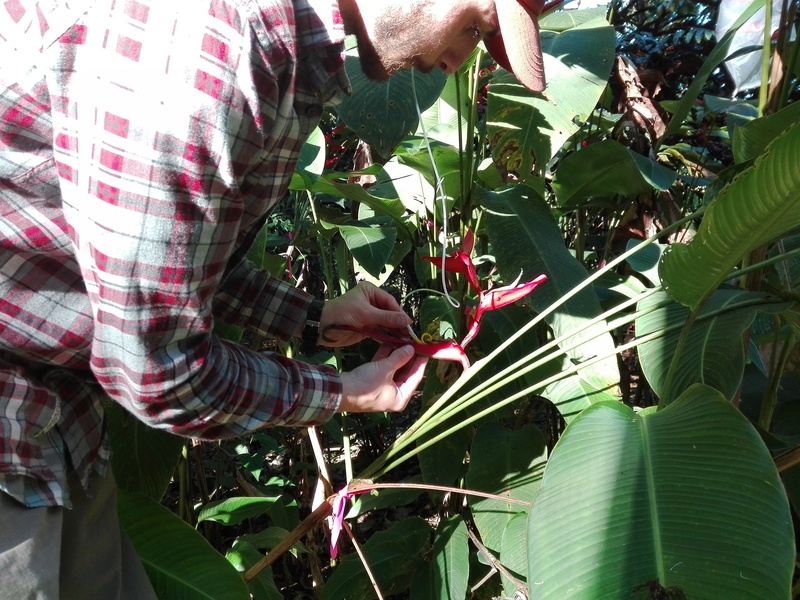 In the Department of Botany and Plant Pathology, first year graduate student Dusty Gannon is studying how Heliconia tortuosa, a tropical plant with long, tubular flowers and vividly-colored bracts (modified leaves that house the flowers), maintains its unique relationship with pollinating hummingbirds. Although hummingbirds universally love nectar, they have diverged into a few distinct functional groups that are characterized by behavior: traplining hummingbirds repeatedly and circuitously visit flowers, often traveling long distances, while territorial hummingbirds are aggressively possessive of flowers in a home range. 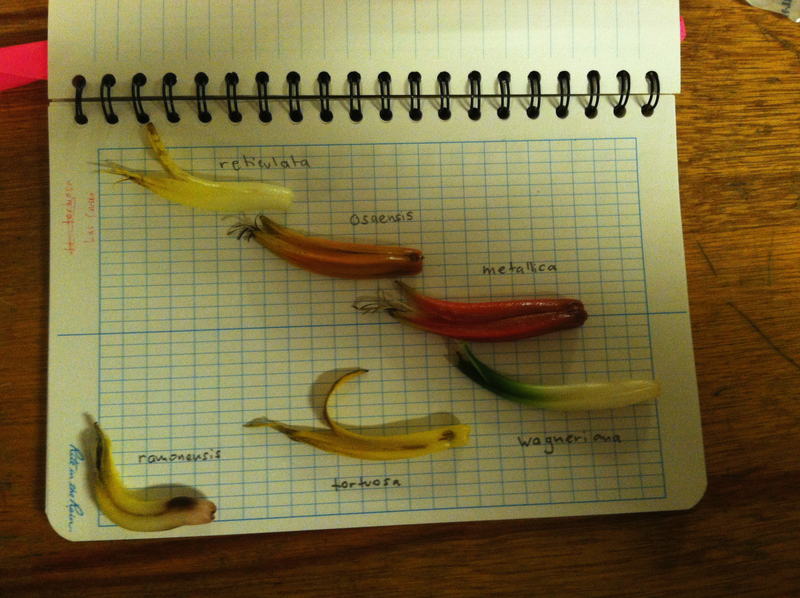 It turns out that Heliconia tortuosa is picky about which of these groups contributes to its pollination, and preferentially accepts pollen from traplining hummingbirds, specifically those featuring a long, curved bill. Presumably, their bill shape facilitates maximal nectar extraction which is used as a cue by the plant to become receptive to pollen. Many hummingbirds visit the Heliconia tortuosa flower, but few induce pollination because of the straight shape of their bill. The shape and size of the Heliconia tortuosa flower in relation to the shape and size of the beak of the pollinator hummingbird constitutes the emergence of a complex plant behavior. the family. 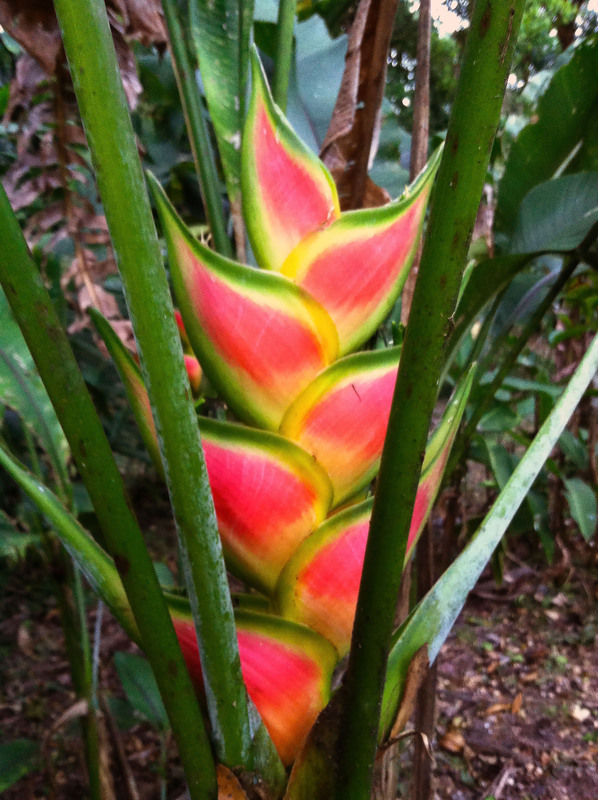 Among these several hundred different species of Heliconia, the flowers are morphologically distinct and vary in size from short to long, straight to curved (even up to a 90-degree angle!). Dusty’s objective is to determine if pollinator recognition is a common trait among morphologically distinct Heliconia species, and uncover the evolutionary significance of this cryptic specialization. 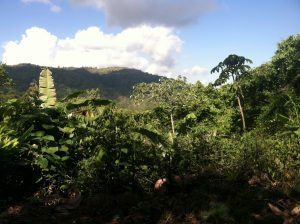 While conducting fieldwork at Las Cruces Biological Station in Costa Rica, which featured a garden full of Heliconia, Dusty collected over 1,000 styles (the female reproductive organ in flowering plants) to assay pollen-tube growth rates across various treatments by epi-fluorescence microscopy back at OSU. Unraveling the tangled evolutionary biology of plants and pollinators is critical for understanding how the loss of certain pollinators might impact plant pollination. If a flower is visited by a variety of different pollinators, the loss of one pollinator might not seem like a big deal. However, if only a small number of the total number of pollinators visiting the flower are capable of inducing pollination, the loss of a true pollinator might be devastating for a plant’s ability to reproduce. As an undergrad at Colorado State University, Dusty studied Ecosystem Science, which consisted of learning about how nutrients and energy flow through an ecosystem. Dusty cites his high school AP Biology teacher as having a major influence on his desire to study science in college. During the first week of his freshman year, Dusty applied to work in a lab doing DNA barcoding; over the span of 4 years, he conducted over 10,000 PCR reactions! Following completion of his undergrad, Dusty planned to climb mountains in South America for a year, but unexpected circumstances expedited his enrollment in graduate school at OSU to pursue research related to pollinator recognition. Following completion of graduate school, Dusty would like to continue in academia as a professor, and possibly open a bread shop featuring a wood-fired oven, equipped with statistical models to ensure a perfect loaf of bread. Join us on Sunday May 21st at 7PM on KBVR Corvallis 88.7FM or stream live to hear more about Dusty’s pollinator recognition research and journey through graduate school. 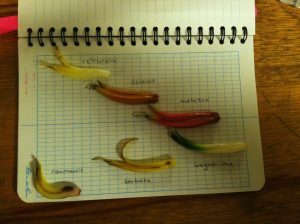 This entry was posted in Botany and Plant Pathology, Enivronmental Sciences, Uncategorized on 2017-05-21 by Lillian Padgitt-Cobb. As a docent at the U.C Btoanical Garden at Berkeley, I so appreciate this information. When the Helinconia Tortuosa blooms in our Tropical House, visitors are fascinated by its morphology.